The Defender is an online radio broadcast geared toward teaching the word of God. Our aim is to present the scriptures of the bible in an informative, systematic process that exalts the person and lordship of Jesus Christ. We are a non-partisan communication format that is committed to expressing the purity of the bible. We strive for inerrant and accurate interpretation of the scriptures by revelation from the Holy Spirit. We present the wisdom and counsel of God that applies to everyday life.The Defender is a media outlet from JamesFoxxMinistries. All the believers in Christ have the privilege to be God’s fellow workers, those who work the work of the Lord(see 1 Cor. 16:10) and even abound in the work of the Lord (1 Cor. 15:58). The way to do this is not by seeing the need to do something for God and going to do it right away, but by first allowing Christ to work Himself into us and make His home in our heart (Eph. 3:17) so that He may grow in us and fill our entire inner being with Himself (Col. 2:19). If we want to accomplish anything in either the natural or spiritual realms, we must engage in spiritual warfare(Ephesians 6:12). In Mark 3:27 Jesus said, “No one can enter a strong man’s house and plunder his goods unless he first binds the strong man. And then he will plunder his house.” When Adam and Eve sinned they turned over the title deed of the earth to Satan. Satan is called “god of the world” in 2 Corinthians 4:4, “Prince of this world” in John 14:30 and “prince of the power of the air” in Ephesians 2:2. In 1 John 5:19, the Apostle John said, “We know that we are of God and that the whole world lies in the grip of the evil one.” We must “first bind the strong man” (Mark 3:27) if we are going plunder his house – this world over which he rules. This is particularly true in seeing people “rescued from the domain of darkness and transferred to the kingdom of His beloved Son” (Colossians 1:13). This is what was taking place in Mark 3:14-15 – “He appointed twelve, so that they would be with Him and that He could send them out to preach, and to have authority to cast out the demons,” which Jesus Himself had been doing. Self-love is the very hallmark of this age, and all the others that follow are results of it. It is this selfishness, broadcast at us incessantly, that causes men to be proud and blasphemers, traitors and boasters, unthankful, and unholy because everything is inward. "Me first, and if I have time, maybe I'll think about seeing to your needs" is the credo of most. But Christians are supposed to have a different hallmark (John 13:34-35; 15:12-13). A Christian's attitude, his outlook, the way he approaches life, is 180-degrees away from the way society has been set up to function by Satan the Devil. We are not to be lovers of ourselves, but we are to love one another as Christ has loved us - totally opposite to the way we would naturally want to go. Pastor Rene Llanos and his wife Acenet has been in ministry since 1991. They are church planters currently serving as presidents of House of Restoration Ministry with churches in Tennessee, Oklahoma, and Florida. They have served as missionaries to the Dominican Republic where they built an orphanage that provides assistance to 160 children. Pastor Llanos serves in several non-profit agencies and is a board member in Montgomery County as the Minority Representative. Pastor Rene and his wife Acenet are active members of The Tabernacle under the leadership of Pastor Anthony & Julia Daley. They have been happily married 31 years and are the proud parents of three children and two grandchildren. Our God is good. When He asks us to obey Him, choosing to do His will even when it is not our will, He is giving us the opportunity for blessing. The will of God always leads to a happy place. The ultimate example of this is Jesus in the garden before His crucifixion. God's will can refer to His perfect plan known since the beginning of time, God's teachings for all people, God's specific desires for a community of people, or God's unique plan for our individual lives. God knows all that will take place, has commanded us to follow certain teachings, and leads and guides both individuals and communities of believers toward certain actions that bring glory to His name. Having a tough time modeling God's message? Feel unappreciated? Misunderstood? A little foolish? Ridiculed? So it goes, pilgrim. Rose gardens and pillow fights went out with the flood. These are rugged days. Without much padding in the seats or protection from the wind. It takes two things to keep from folding in the stretch: a tough hide and a tender heart. Hosea had both. And the scars to prove it. He died rejected and ignored. So did Christ . . . until the resurrection. Pastor Terry Kirby is a lay pastor with The Tabernacle Church at the Stewart County location in Dover TN. He has served as a youth pastor and mentors to countless young people. He and his wife have one son and has fostered two children in their home that they adopted while being parental guides to many. Terry and his wife have been married for 25 years and in active ministry for 27 years. They have a heart for the young and seeing souls saved into the grace of Jesus Christ. 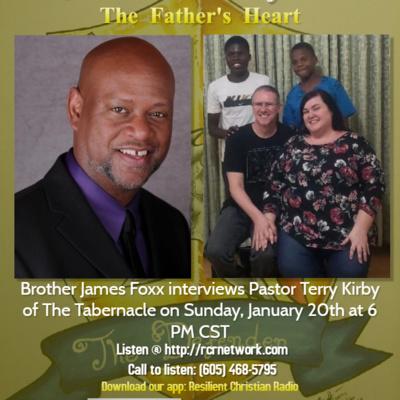 Pastor Terry demonstrates the heart of the Father for all those he comes in contact with letting them know that every soul has value and every soul has worth in the eyes of God. The breaker is come up - He who is to give them deliverance, and lead them out on the way of their return. He who takes down the hurdles, or makes a gap in the wall or hedge, to permit them to pass through. This may apply to those human agents that shall permit and order their return. And God is at their head may refer to their final restoration when the Lord Jesus shall become their leader, they have returned unto Him as the Shepherd and Bishop of their souls; and they and the Gentiles forming one fold under one shepherd, to go no more out into captivity forever. Lord, hasten the time! If we allow the Lord to touch us through His Body concerning our demeanor, attitude, function, and measure in the meetings, we may have a way to go on with Him. We need to come to the Lord personally and let His light– in His time and in His way – shine on us concerning our living in the church life and our function in the Body. You’ll find this all through the Scriptures in the lives of God’s hidden servants: God hid Joseph in prison before he came to the palace. He hid Moses in the desert for a third of his life before he led the people out of Egypt. God hid David in the mountains, running in and out of caves from Saul before he was recognized as king. In the New Testament, God hid Paul for three years in Arabia after his conversion, before he became a missionary. And, God hides Elijah at Cherith before his great life contribution at Carmel. Don’t count it a strange thing if God hides you. Here’s the principle: When God chooses to hide you for a time, He is preparing you for a greater purpose. The whole of Romans 6:4 says, "We have been buried therefore with Him through baptism into death that as Christ was raised from among the dead through the glory of the Father, even so, we also should walk in newness of life." The Greek word translated "that" here can be rendered "in order that" pointing to a result, an issue. If we are not buried into Christ’s death, we cannot have the result spoken of in this verse. We have been buried into death in order that we may walk in newness of life. The reference to Christ’s being raised from among the dead through the glory of the Father indicates a glorious resurrection. As Christ was raised from among the dead in a glorious resurrection, even so, we also should walk in newness of life. However, many do not experience the death of Christ; yet they endeavor to walk in newness of life. You were the one buried into death. The one who has been resurrected to walk in newness of life is not the original you, the one who was buried; it is Christ with you. We Christians are too natural. Our thinking and our understanding are so natural. We even understand the Bible according to our natural mentality. Because we are still governed by our natural concepts, we may say, "The Bible tells us that we should walk in newness of life. Therefore, let us walk in newness of life." But this is not possible if we have not been buried and if we do not remain in death. If we come out of death, how can we walk in newness of life? It is impossible. The Lord, who is the believer's light, is the strength of his life; not only by whom but in whom he lives and moves. In God let us strengthen ourselves. The gracious presence of God, his power, his promise, his readiness to hear prayer, the witness of his Spirit in the hearts of his people; these are the secret of his tabernacle, and in these, the saints find cause for that holy security and peace of mind in which they dwell at ease. The psalmist prays for constant communion with God in holy ordinances. All God's children desire to dwell in their Father's house. Not to sojourn there as a wayfaring man, to tarry but for a night; or to dwell there for a time only, as the servant that abides not in the house forever; but to dwell there all the days of their life, as children with a father. Do we hope that the praising of God will be the blessedness of our eternity? Surely then we ought to make it the business of our time. This he had at heart more than anything. Whatever the Christian is as to this life, he considers the favor and service of God as the one thing needful. This he desires, prays for and seeks after, and in it, he rejoices. One of the most important things in our lives is the control of our minds. Our thoughts are powerful. They can harm us or do us good. The Bible says, “As [a person] thinks … so is he” (Proverbs 23:7). Many people have troubled minds. There’s a story told in the eighth chapter of Ezekiel about priests and leaders who on the outside were worshiping the true and living God, but who on the inside, in their minds, had idols. They were worshiping other gods and acting out sexual fantasies, and God condemned them as great sinners. Pastor Anthony Daley is the author of The Ekklesia: The Church That Jesus Is Building. He has been married to his wife Julia for over twenty-five years. They have two adult children who serve in the ministry. Together with The Tabernacle Church, the Daley’s hope to build platforms that the next generation may stand on. Your spirit is so BIG we had to cover the Supernatural Man in three episodes! This broadcast should see your understanding to what it is to be a Supernatural being and the victory you will experience if you choose to let your spirit be the Super in your life! We are not supposed to be normal. We are supposed to be naturally Supernatural! Take a journey on this broadcast as we open up how you can live an uncommon life by the power of your Supernatural self! When a person trusts in Christ in faith, whether they realize it or not, they have been enrolled in the “school of faith.” Consequently, as Christians, we never know what may happen next because God, who works all things together for good, uses our trials as tools to promote spiritual growth and maturity. The Vicissitudes of Life: Will you stay with God? When you worry, you are choosing to be mastered by your circumstances instead of by the truth of God. The vicissitudes and trials of life pale in comparison to the greatness of salvation. Jesus wants you to realize it doesn’t make sense to believe God can save you from eternal hell, but not help you in the practical matters of life. The Apostle Paul reflects a similar desire in Ephesians 1:18-19: "I pray that the eyes of your heart may be enlightened, so that you may know what is the hope of His calling, what are the riches of the glory of His inheritance in the saints, and what is the surpassing greatness of His power toward us who believe." When you catch yourself worrying, go back to Scripture and let God open your eyes again. Fathers are supposed to bless their sons and not curse them. Fathers are supposed to raise up their sons and not tear them down. Fathers give sons two main things for life. Identity and Inheritance. Many issues facing men today is the absence of fathering which has created an orphan spirit and heart. Leaders in business, ministry and home life are ill effected because they have been wounded by fathers or those who are supposed to mentor and guide them. Today is your day to be healed from the wounds inflicted from your father. Let the word of God bring you to a place of forgiveness, wholeness and restoration. Therefore, by the mercy of God, we do not lose heart. But we have renounced disgraceful, underhanded ways. We refuse to practice cunning or to tamper with God’s word, but by the open statement of the truth, we would commend ourselves to everyone’s conscience in the sight of God. And even if our gospel is veiled, it is veiled only to those who are perishing. In their case the god of this world has blinded the minds of the unbelievers, to keep them from seeing the light of the Gospel of the glory of Christ, who is the image of God. For what we proclaim is not ourselves, but Jesus Christ as Lord, with ourselves as your servants for Jesus’ sake. For God, who said, “Let light shine out of darkness,” has shone in our hearts to give the light of the knowledge of the glory of God in the face of Jesus Christ. But we have this treasure in jars of clay, to show that the surpassing power belongs to God and not to us. Prosperity begins in your spirit. There are many avenues to being prosperous, but to be prosperous the way God intends is to do it His way. Their is a mind set that comes with a prosperous person regardless of what condition or circumstance they are faced with. There is a responsibility for everyone who receives Christ in their spirit. The common notion is one person preaching to many in the pews. However God's original intention was not the way we practice. Everyone is supposed to have the opportunity to speak forth Christ in the capacity of what they are endowed with. We all are priests in God's eyes and should function as such. We are told in Ephesians 4:24 that we must “put on the new man, which after God is created in righteousness and true holiness.” One of the reasons that biblical separation is not seen or even desired by many is that the New Birth is not viewed in its fullness. What we mean by this is that the New Birth is simply viewed as “salvation,” which is basically sins forgiven and adoption. “I’m no longer on my way to hell, but to heaven; I am no longer under the wrath of God.” Thank God this is true, for the New Birth does bring salvation from sins and deliverance from hell. But it must be seen from a further perspective as well. The issue of suffering and prosperity in life and their relationship to the righteousness of individuals is one that is both important and complex. What can I expect if I choose to diligently follow God's will in my life? Will my righteousness result in more or less suffering? Will it result in more or less prosperity? We all want to understand, as well as minimize, the amount of suffering in life, and to understand as well the sources and legitimate role of prosperity in life. This fellowship began in Paris TN in 1999, in a small conference room at the Hampton Inn. That small conference room evolved into a 16,000 square foot facility sitting on 2.5 acres that is now known as "CIP" Church In Paris. Pastor Leon and Veronica White are a team that have served in the Ministry for 40 years. This Church is committed to your spiritual growth and maturity, and we are reaching out to one soul at a time. When you walk into the doors at this Church, you will be loved. 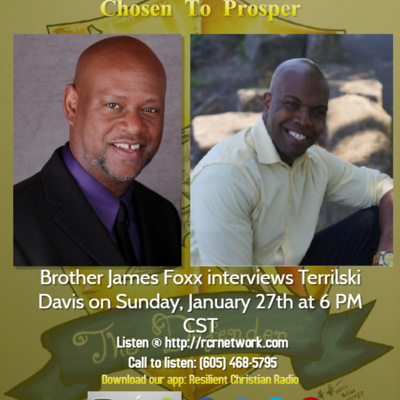 Brother James interviews Prophet Jeremy Caris. 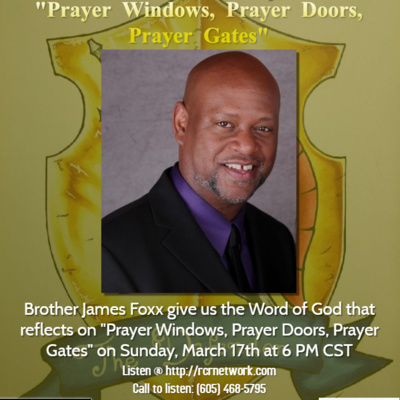 Jeremy Caris is the founder and president of Caris Ministries. Since he is called as a prophet and gifted as a teacher, much of his focus involves equipping believers to hear, know, and follow God in their own daily experience. He teaches the foundational truth of the Word with simple clarity while revealing deep things of the spirit in practical ways. He has the unique ability to demystify the supernatural side of a real relationship with a living God and make it an embraceable and accessible reality for all believers. Jeremy has been married to his best friend, Mandy Caris, for seventeen years, and is the proud father of two boys. Every other religion in the world is based on man's efforts to reach God. These world religions teach that man must somehow do righteous deeds or perform religious service in order to become good enough for salvation. In order to be saved a person must pray a certain number of times, in a certain manner, facing a certain direction. Or he must wear a particular type of religious garment. Or he must visit a certain religious shrine or temple. Or he must worship in a particular way. Some religions require sacrifice and even the infliction of pain upon a believer in order to become holy in the sight of God. Some extreme religions require adherents to beat themselves with whips or rods to show their devotion to God. Some require pilgrims to crawl on their knees a certain distance in prayer in order to earn righteous points with God. Some religions require worship on Friday; others on Saturday; and others on Sunday. Our God says call on the Lord Jesus Christ and you shall be SAVED! The Bible teaches that Jesus has made peace between sinners and God the Father through THE BLOOD OF HIS CROSS. Notice that Jesus didn't make peace through “the cross”; but rather, through “the blood of His cross.” IT WAS THE BLOOD! Jesus shed His blood while on the cross, and then that physical, literal, precious, blood was taken to Heaven to be “SPRINKLED” upon the Mercy Seat in the heavenly tabernacle. In other words, THERE IS ROOM FOR YOU ON THE CROSS!!!! There is a difference between knowing about God and truly knowing God! "Know" is a word in the bible that describes being intimate with someone. It connotes a joining together like when a marriage is consummated. When you "know" someone they are in your business and you are in theirs. God desires for us to know Him the same way He knows us. Betrayal can be heartwrenching! Have you ever been betrayed by someone? If you have, you are aware how deep it cuts. Moreover have you ever considered that your promotion may be tied to how you handle being betrayed. This segment will give you a whole new perspective! Being hurt by the church is not something that happens once in a while. We often find people who have been deeply wounded by the family of God, leaving them worn and exhausted. We continually see leaders who are in conflict within the body of believers, robbed of the joy that Jesus promised. When we examine our own bruised souls, it can make us want to leave the church and even want to “back burner” our God who seems to have allowed it all. The Curse of the Vagabond is found predominantly in the lives of church hoppers, those who reject the ministry of fathers and those who despise the authority of leaders. The Curse of the Vagabond inhibits one from having the ability to BE PLANTED which results in aimless wandering. Indeed it UPROOTS one from the very place of love, ministry and needed expression. Life is full of uneven terrain. Sometimes our ground is not level because we have to climb mountains or dig ditches. The mountains and ditches may be our doing. It may be because someone else is making us climb or dig. In our spirits, we always long for level ground, an even playing surface, sure-footed living. What's the surface like that you're moving on today? How does it look and feel to you? Are you cruising along the highway of life, coasting downhill or in a ditch? Are you loving the climb or exhausted? Are you suffering from your own doing, or have others got you digging ditches? Power is an attractive endowment that humans covet for. We want power because of how it makes us feel and what it gives us access to. However what is often overlooked is that before power comes to anyone they must have the authority to execute the power they have. 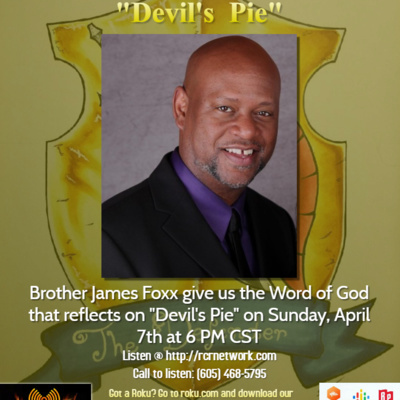 Join us in this broadcast as we open the missing element of having the power we so often crave. Only those that show up at the table are ready to eat. Our attitude must be one of hunger ready to feed on the life of Christ. If you stay hungry for the things of God then your appetite will always be satisfied by the sustenance of Christ as Life. If you can believe it you can achieve it. We have heard this statement throughout life's challenges and how true it is. Sometimes what you desire can seem a mere dream of empty wishes. But if you hold fast to the word and make no room for doubt, then all things are possible. The key in the statement is all things are possible....possible for who? only to them that believe! Hear the testimony of a young man totally wrecked by the transforming love of God. This is the story of Pastor Timothy L. Davis of Greater Hope Missionary Baptist Church in Murray KY. 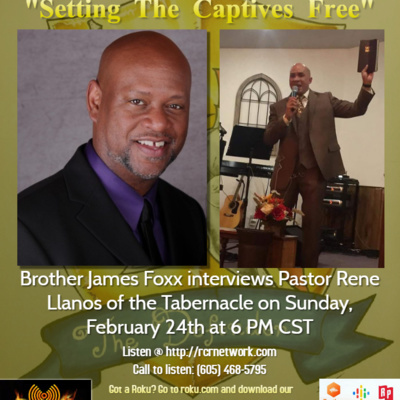 Listen to his journey from the despair of being without a father and drug addiction to preaching and teaching the word of God to generation that needs to encounter the love of God. All of us do things that we are not proud of. Sometimes we do things that are so out of character that we wish we could undo. People can hold things against you and never let you live it down. But there is ONE we know that is always ready to give us another chance we we mess up. Thank God for his mercy! Change is inevitable. The great change that we have experienced is Christ being made alive in our life. Jesus Christ is the great change maker! Join us as open up the reality of the change that has come to us! Drug addiction is cutting lives short in America at an alarming rate. The number of drug related casualties is at epidemic proportions. Join Bro. 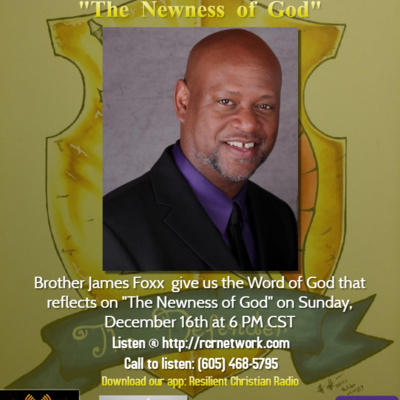 James Foxx from JamesFoxxministries, host of The Defender on Recovery Live Radio. 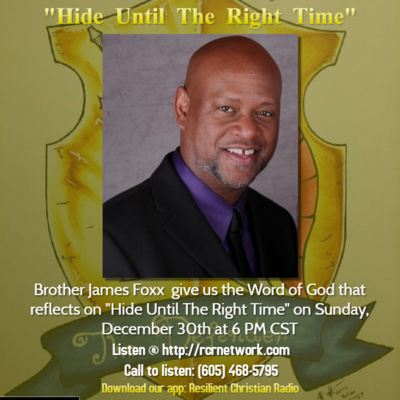 This interview will unmask and expose the spirit operating incognito that many fail to see that is the cause behind the tragedies we are witnessing in our society. There are many things in the world that people try to draw life from. When we realize that the total essence and embodiment of life is wrapped up in Jesus Christ we will have power to live an overcoming life. We all want substance. Substance has solidity and reality. Isn't that what we all desire? We can find flaky substitutes in almost anything tangible. An off brand product may have a similar look, feel or taste, but it is nothing like the original. When we say substance we mean something that can fill us up and satisfy us. Every part of life has a different aspect that can give us a sense of fulfillment but it is not the true element. When we understand that Jesus Christ is the reality of all things then satisfaction is in our hands. We have the answer! It is him and him alone. The world does not want you to believe the truth of his substance, which is God releasing his total being in the person of Jesus Christ. Join in as we open up the reality of Christ as the substance of Life. God has a way of communicating with us. Many people get frustrated because they don't feel that God can speak to them. The primary way God communicates is through his word. Secondarily, when you become a spirit filled believer God communicates through our spirit. You must have the proper organ to receive what God communicates. God is a spirit, therefore his communication is through the spirit and not the mind. Numerous people are disappointed due to trying to access God with their mind and not their spirit. Furthermore your spirit has to be on the same frequency to receive what God speaks. In order for that to happen you must have his spirit dwelling inside your spirit. The only way to have his spirit is to tune your spirit to his channel and frequency. The first step is to repent of your sins and accept the Lord Jesus Christ into your heart. Once you receive him into your heart, your spirit which before was dead to God has now been made alive! Now you are ready to hear God speak!